No country home is complete without a pretty garden. Whether you’re looking to create an informal cottage garden full of colour and fragrance, a formal garden with structured design and architectural interest; an outdoor living space, or an eco-friendly garden that's a haven for wildlife, be inspired by this wide selection of real gardens, lovingly transformed over time to do justice to the stunning period properties that they surround. Find out how design a garden from scratch, find tips and advice on choosing plants. 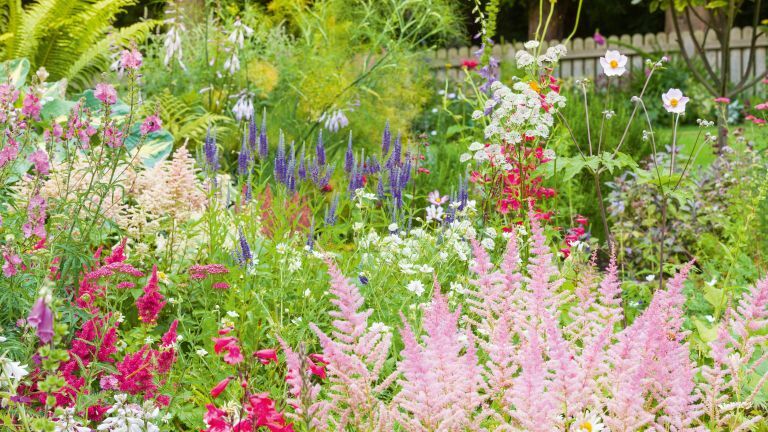 Rosie and Robin Lloyd have embraced the challenges of creating an English country garden on chalk in the South Downs to create an informal, colourful cottage garden to delight the senses. Set on a sloping site, with cottage-style planting throughout, featuring many old-fashioned favourites, the front garden is terraced and split into rooms, while the more naturalistic-style back garden leads to a wildflower meadow. Find out how to make the most of your sloping garden. Interior designers Anne and Anthony used their eye for composition to transform a woodland-encompassed Surrey plot. Set in an Area of Outstanding Natural beauty, the secluded garden combines a formal sunken topiary parterre with verdant striped lawns and terraces perfect for outdoor living and entertaining. Browse our inspiring outdoor living space design ideas. Boasting spectacular vistas across Kent salt marshes, this garden started off as a neglected plot of mixed shrubs, rough grass and a few trees, but the owners have transformed it into a beautiful ensemble of curvaceous floral borders, manicured lawns, and pretty patio areas for al fresco dining. If you're feeling inspired, discover how to create the perfect patio. The garden, which envelops a 15th century farmhouse, has a relaxed ambience with a planting palette of purple, white and grey. Sarah Fraser has filled her country garden with a riot of colour. She uses tulips as her paint and her garden as a canvas, experimenting with the different shades, and has painstakingly planted over 2,000 bulbs by hand. Enclosed by walls and a tall leylandii hedge, the west-facing plot is dominated by an ancient holly that has been painstakingly sculpted into a gigantic bowler hat. From the house, steps lead down from a stone terrace decorated with pots, to a broad lawn edged in borders that are overflowing with colour-themed spring bulbs, shrubs and emerging perennials. A summerhouse, parterre and potager are tucked away in corners. Browse more beautiful traditional summerhouses for inspiration. Retired physiotherapist Sue, and her husband Peter de Wit, had never lived in one place for long enough to fully appreciate their gardens. In 2010, they put down roots in the beautiful Royal Tunbridge Wells, Kent, with an acre of plot on which to create the garden of their dreams. The couple have turned this beautiful setting into a space for relaxing and outdoor entertaining. There are two large flat lawns and plenty of colourful beds, with the choice of plants influenced by Sue’s childhood in Australia and Peter’s Dutch heritage. Planning a garden party? We have a gallery of gorgeous garden party ideas for you to browse. Set within a bluebell wood, the gardens of this Hampshire cottage had not been touched for 40 years when its new owners bought the property. It was overgrown and in serious need of fencing and clearing. Nettles had taken hold and brambles towered around fallen trees that needed removing. With love and care the garden has been transformed. The bluebells were carefully cultivated, and an area has been set aside as a wild garden, where self-seeding plants are given free rein. There is also a lovely seating area in the more formal pebble garden, enclosed in clipped buxus spheres. A raised fruit bed and vegetable plot offer a variety of grow-your-own produce, and a cottage garden billows with bee-attracting flowers and herbs. Find out how to plan your kitchen garden. When designing her own garden, landscape architect Marian Boswall had big ideas. Not only did she want to capture her philosophy of working with the setting while respecting the ecology of the land, but the garden also needed to reflect the informality and comfort of her medieval cottage. The result is a relaxed country garden with flowing plants, meandering paths, and water features. Find out everything you need to know about garden water features. With lovely views across the Low Wield Special Landscape, the garden is more structured near the house and becomes looser as it melds into the woodland areas. A hidden garden lies behind a high hedge, with a small opening leading to a large lawn with borders. On the south facing edge, long grasses and perennials were chosen to attract wildlife. Create your own luscious wildlife garden with the help of our tips. It is apparent from the moment you enter this picturesque garden that its owner Meryl Walters has a background in interior design. A skilled use of colour is immediately evident: spring bulbs enhance the fresh greens with pockets of orchestrated combinations of hues, as garden areas unfold to the captivating views beyond. The initial priority was to plant hundreds of trees, mostly native, including oak, beech, ash, alders, poplars and cherries, to improve privacy in the garden and to muffle the sound of the nearby road. Without a set plan, although with constant support from her husband, Peter, Meryl has slowly created the garden creating shapely lawn areas, colourful flower beds and pleasant seating areas. Jude and Mat Jansen have filled their cottage garden with textures, shapes and colour, planting everything from lavender, phlox, and roses, to lilies, clematis and lobelia. Their beautiful displays of fluffy astilbe, hostas, sweet-smelling roses and purple masses of lavender, peppered with helenium and phlox, are a sight to behold. Discover how they created their beautiful garden, then discover how to create your own cottage garden. One of Jude's favourite plants, hostas, with their lush foliage, variegated colours and beautiful leaf shapes, look spectacular grouped together in pots on a patio, or planted as a border display. Find advice on how to create successful displays with container planting and be inspired by these traditional cottage gardens.